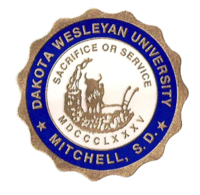 Dakota Wesleyan University (DWU) is a four-year university in Mitchell, South Dakota. It was founded in 1885 and is affiliated with the United Methodist Church. The student body averages slightly fewer than 800 students. The campus of the university is listed on the National Register of Historic Places. In 1883, a small band of Methodist settlers meeting in the Dakota Territory secured a charter to found the college as Dakota University. These pioneers were driven to "build a college of stone while living in houses of sod," and had deep religious convictions about the education and future of their children. They envisioned an institution that epitomized the highest in Christian thought and deed, and so adopted the motto, "Sacrifice or Service". This is symbolized in the collegiate seal of the altar, the ox, and the plow. On October 14, 1904, the institution assumed its present name of Dakota Wesleyan University. By 1920, Dakota Wesleyan University was the largest independent college in the state, with an enrollment of more than 300. The Great Depression, which hit the prairie harder than any region in the nation, evoked a regionally sensitive response from Dakota Wesleyan. The university accepted many students who had few or no resources, with farm produce being accepted for tuition, and personnel took severe cuts in pay to educate those with no other options. The university, which was sustained by the Methodist church as in earlier days, gave teachers housing in Graham Hall and coupons to purchase merchandise in town. Since the 1930s, the university has continued its attempts to remedy region-specific needs. Strong programs in teacher education have provided new teachers for school districts, and nursing and allied health programs address the continuing need for health care professionals in rural South Dakota. In recognition of the diverse cultures in its changing prairie environment, Wesleyan has begun special programs focusing on Native American culture. Additionally, university programs assist students whose previous educational experiences have inadequately prepared them for their future. About half of the campus, including its central U-shaped quadrangle, was listed on the National Register of Historic Places in 1976. Dakota Wesleyan University dedicated the new George and Eleanor McGovern Library and Center for Leadership and Public Service on October 7, 2006 to a crowd of nearly five thousand people, with former President Bill Clinton honoring former Senator George McGovern and his wife Eleanor McGovern for their public service. Other dignitaries who spoke including former Senator Tom Daschle, Senator Tim Johnson, Senator John Thune, Representative Stephanie Herseth Sandlin, Governor Mike Rounds, and USA Today founder Al Neuharth. The McGovern Center seeks to prepare Dakota Wesleyan's top students for future leadership and careers in public service through classes, seminars, research, and internships. It also includes the annual McGovern Center Conference, the McGovern Library, and the McGovern Legacy Museum, which gives visitors a look at the lives of the couple. It is also associated with the DWU Tiger Poll which does public opinion polling. Dakota Wesleyan teams, nicknamed athletically as the Tigers, are part of the National Association of Intercollegiate Athletics (NAIA), primarily competing in the Great Plains Athletic Conference (GPAC). They formerly competed in the South Dakota Intercollegiate Conference (SDIC). Men's sports include baseball, basketball, cheerleading, cross country, football, golf, soccer, track & field and wrestling; while women's sports include basketball, cheerleading, cross country, golf, soccer, softball, track & field and volleyball. In 2015, the men's basketball team won runner-up in the 2015 NAIA Division II Men's Basketball Tournament. Francis Case, former U.S. Congressman from South Dakota. Wikimedia Commons has media related to Dakota Wesleyan University. ^ "Novak named president at DWU". April 18, 2013. Archived from the original on April 24, 2013. ^ Dakota Wesleyan University, Athletic Department. "Women's basketball wins first ever national championship". Dakota Wesleyan Tiger Athletics. Dakota Wesleyan University, Mitchell, SD. Retrieved 10 April 2018. ^ "Harlan J. Bushfield". National Governors Association. Retrieved 2 September 2012. ^ Dakota Wesleyan University, Athletics Department. "Baseball Stats and History" (PDF). Dakota Wesleyan University. Archived from the original (PDF) on 2013-09-25. ^ "Ben Jukich, the only DWU player selected in the MLB draft, playing in South Korea". Retrieved 17 January 2017. ^ "NAIA All-Americans". NAIA.org. Retrieved 17 January 2017. This page was last edited on 20 September 2018, at 15:53 (UTC).